Up until the end of the nineteenth century, when the British Museum purchased the papyrus containing the the Athenian Constitution, nothing was known about the Athenaion Politeia other than through the references and citations by ancient writers in their works. 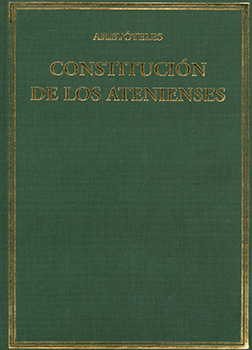 The Athenian Constitution was part of the great collection of a hundred and fifty eight Politeiai or constitutions of different Greek and barbarian states that the ancients attributed to Aristotle but which unfortunately have been lost. The text basically focuses on two issues: a journey through the political history of Athens from its origins to the restoration of democracy in 403 BC, and a detailed description of how the system operated and the Athenian State was organised. In the Athenian Constitution, Aristotle reflects both the reality of law in the great city state and the context in which it developed over history, and the main moments of political-administrative innovation. The work also shows Hellenic thought on Athens's political and socio-cultural configuration. The work takes a descriptive approach, similar to that used by Aristotle in his scientific works, combining the empirical with the observational, with relevant critical and evaluative contributions. This book was added to our online catalog on Tuesday 14 April, 2015.